These 7 adorable hand embroidered iron-on patterns are good for 2 or more transfers. 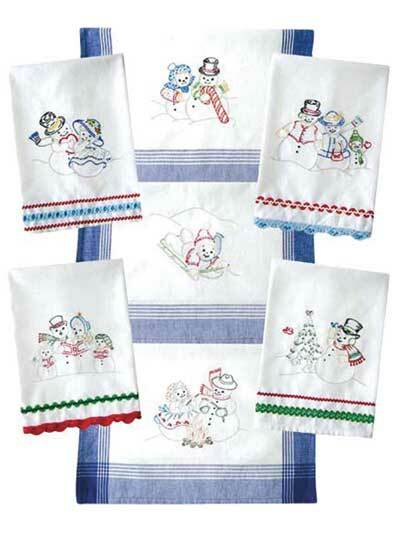 Use metallic thread to embroider the snow people. Since snowmen can be found all winter long, one has a candy cane and another has a Valentine, covering all of the winter holidays. 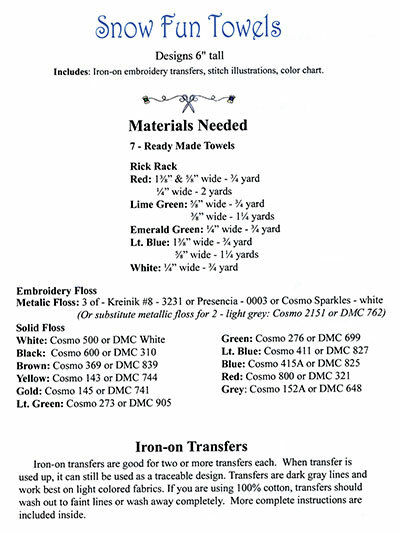 Towels can be trimmed with rickrack and embellished with embroidery. 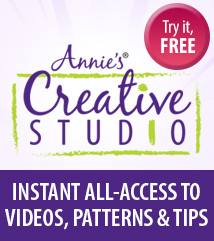 Pattern includes iron-on embroidery transfers, stitch illustrations and a color chart. Each design is 6" tall. These are the cutest Iron On Embroidery Patterns. Please, please make more. They are so easy to stitch. I prefer the iron on better. I ordered the tracing ones, also. If you don't have a light box they are hard to trace. But for us seniors the iron on are better. Excellent quality.